Singer Stitch Sew Quick may work for you. Do not go with a lot of expectations, you only get what you pay for. Personally speaking, I am not really a big fan of handheld sewing machines. The main reason is the inconsistent quality, that is pretty much associated with almost all handheld sewing machines. When I took Singer Stitch Sew Quick in my hand, I didn’t actually felt it on my hand. It is very very light indeed. This machine operates on four AA batteries or a power adapter. The funny thing is that, both are not included in the box. You will have to buy batteries or power adapter separately to get this machine working on the first hand. 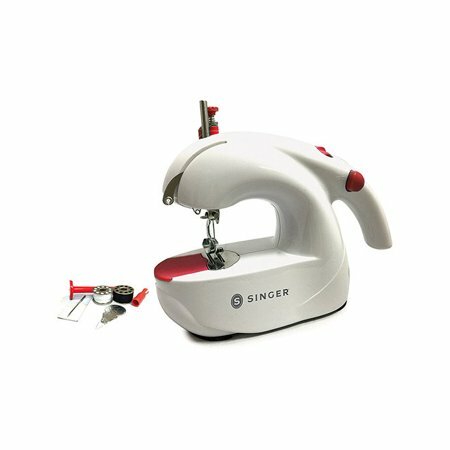 Singer Stitch Sew Quick is a machine designed for quick fixes as the name suggests.The box contains bobbins, needles, thread spindle and threading tool. My first advice will always be, read the user manual thoroughly. Even then, you are going to have some trouble to get used to this little machine. Ease of use wise, Singer Stitch Sew Quick needs a lot of improvement. Threading is difficult, but if you read the manual and use the threading tool that comes with machine in the right way, you can get through it. One common problem with this machine is that the stitches come off rather quickly. You must tie off the end thread to prevent it from unraveling. There are instructions on the user manual on how to pull the thread without disturbing the stitches. Being a low cost machine, it is bound to have some limitations. The most common issues are with tension and stitch skipping. You constantly need to keep an eye on the stitches as it skips stitches pretty often. Another thing is that, the needle doesn’t lift up much, so you will have difficulty in getting the fabric underneath. Singer Stitch Sew Quick will never be a replacement for a regular sewing machine. You can use it for fixing things in a pinch. It may work for Card-making and scrapbooking. If you approach this machine with a lot of expectations, I am sure you will be disappointed. You get what you pay for. If you don’t want to spend a lot of money on a sewing machine, this might be a good option. If you are really serious about sewing, you can have a look at our list of ‘Top 10 Sewing Machines Under $200’.